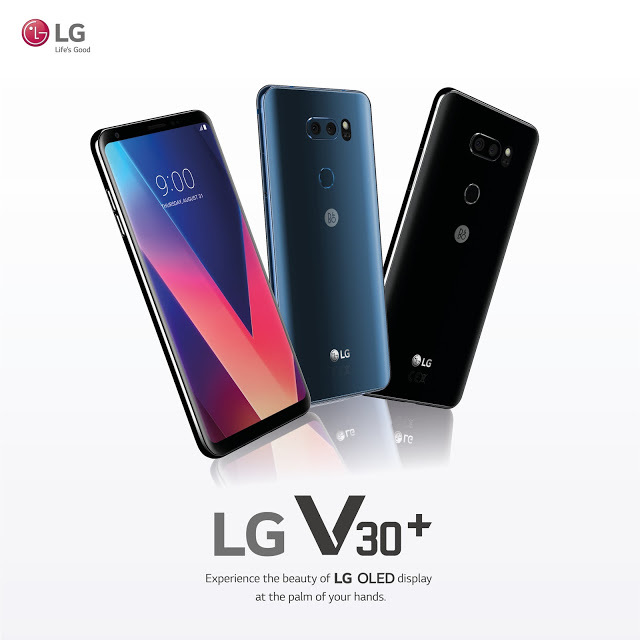 If you enjoy the incredible colors and contrast of LG’s best-in-class OLED technology on its flagship TV lineup, you will be glad to know that LG has brought its OLED panels to mobile with the LG V30+. The centerpiece of the LG V30+ is a massive 6.0-inch OLED FullVision with an elegant bezel-less design. It features all the deep blacks and vivid colors for which LG’s OLED panels are well known, as well as a crisp 2880 x 1440 resolution that showcases eye-popping detail in any content. The display also supports the HDR10 and Dolby Vision standards, which allow it to show a wider range of brightness and contrast levels and color depth than ever before in supported high dynamic range content. A good display needs good content, and with the LG V30+’s high-end camera system, you can capture your own moments in incredible detail. The dual camera features a huge f/1.6 aperture to let in more light than other smartphone cameras. It also has both standard-angle and wide-angle cameras that allow you capture a greater field of view as you see fit. And with LG’s Cine Video mode, mobile videography takes on a whole new level of cinematic detail – a perfect companion for the OLED display. Aside from its best-in-class display, the LG V30+ also features all the hallmarks of a modern flagship smartphone, including the top-tier Snapdragon 835 chipset, 4GB of RAM, 64 or 128GB of onboard storage, and IP68 certification for water and dust resistance. It also comes with a plethora of secure unlock options, including Face Recognition, Voice Recognition, Fingerprint Sensor, and Knock Code. 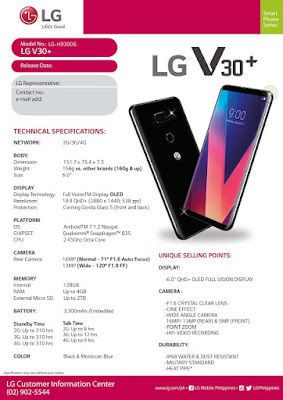 With the launch of the LG V30+, LG’s world-class OLED technology levels up your viewing experience right in the palm of your hand.